The most important point to consider when using contact lens cleaning solutions is to choose one that can both disinfect and clean properly. Do not only use a saline solution, as this is solely for rinsing the lens, and definitely don’t store them in saline. Your best option is a Multi-Purpose Solution (MPS) that uses a special form of Hydrogen peroxide. Older versions of MPS were not as strong, but the newer types really do a great job. When you clean your contact lenses, you need to be aware that the efficacy of each cleansing treatment only lasts for 3 to 5 days. If you don’t wear your contact lenses for a week, you will need to clean them the night before you are planning to wear them again, essentially re-disinfecting before you wear. This has to be done, or all bacteria will not be successfully eliminated. 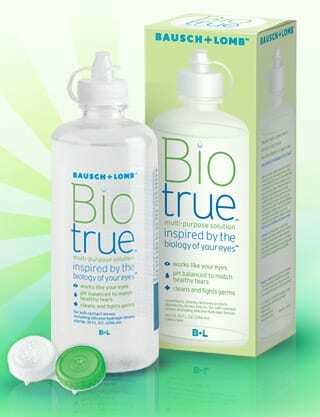 Visual Q Eyecare stocks all the major contact lens solutions, including Bio true, which we swear by. Check with our in-house optometrist Susana to see which cleaning solution is best for you. We carry many high quality brands, but we’ve been using a lot of the new Biotrue solution, as it includes more moisturising agent than most. It is very good. Remember to always check the expiry dates on your lens cleaning solution bottle, and once opened throw it away after a maximum of 3 months (this is quite a lenient time frame).